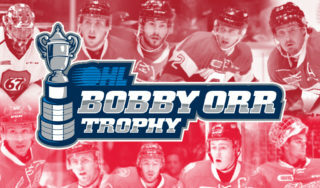 Toronto, ON – The Ontario Hockey League today announced the Top OHL Performers of the Month for regular season games played in November 2018, including Niagara IceDogs forward Jason Robertson, Ottawa 67’s defenceman Noel Hoefenmayer, 67’s rookie Marco Rossi and London Knights goaltender Joseph Raaymakers. Niagara IceDogs forward Jason Robertson is the OHL Player of the Month for November after leading all players with 30 points including 12 goals and 18 assists along with a plus/minus rating of plus-9 over 12 games. The Dallas Stars prospect split the month between the Kingston Frontenacs and Niagara IceDogs, recording points in all 12 of his November contests. He registered a pair of hat-tricks while recording four points on four different occasions, being named first star of the game four times, second star twice and third star once. Robertson’s first hat-trick came on Nov. 7th in a four-point showing with Kingston as they fell 6-4 to the Ottawa 67’s. He scored another hat-trick and four points on Nov. 11th, defeating the Oshawa Generals 5-1. Robertson picked up four assists in his final game as a Frontenac on Nov. 18th, defeating the Hamilton Bulldogs 5-3. He wrapped up the month of November with back-to-back four-point efforts with the IceDogs, recording a goal and three assists in wins on Nov. 29th and Nov. 30th. In his four November games with Niagara, Robertson had three goals, nine assists and 12 points. 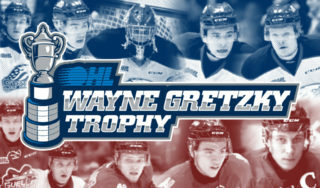 A 19-year-old native of Northville, Mich., Robertson sits second in OHL scoring with 52 points including 27 goals and 25 assists over 29 games this season. His 10 power play goals and 22 power play points also lead the league while his 152 shots on goal are second-most. After four years in Kingston, Robertson finished with 124 career goals, the fourth-most by any player to wear a Frontenacs uniform. Ottawa 67’s blueliner Noel Hoefenmayer is the OHL Defenceman of the Month for November. The Arizona Coyotes prospect recorded 16 points including three goals and 13 assists along with a plus/minus rating of plus-9 over 12 November contests. Hoefenmayer had five different multi-point performances headlined by a four-point showing against the Sault Ste. Marie Greyhounds on Nov. 16th. Hoefenmayer had two goals and two assists in that game, including one that served as the OHL’s representative in the weekly CIBC Showdown. He finished the month with points in three straight games, wrapping things up with a goal and two assists in a 6-2 win over Kingston on Nov. 28th. A 19-year-old from North York, Ont., Hoefenmayer has 25 points including five goals and 20 assists along with a plus/minus rating of plus-14 over 29 games this season. The 6-foot-1, 204Ib. defender is currently in his fourth OHL season and picked up his 100th career point this past month. He was Arizona’s fourth round pick in 2017 and was originally a second round pick of the 67’s in the 2015 OHL Priority Selection from the Don Mills Flyers Minor Midgets. For the second straight month, Ottawa 67’s forward Marco Rossi is the OHL Rookie of the Month. The first-year centreman had nine points including four goals and five assists over seven games before suffering an elbow injury on Nov. 15th that will sideline him into the new year. Rossi had points in five of his seven outings, stringing together a five game point streak. He had a goal and an assist in an 8-2 road win over the Saginaw Spirit on Nov. 4th, a goal and two helpers in a 6-4 victory over the Kingston Frontenacs on Nov. 7th and a pair of goals in a 4-3 loss to the Oshawa Generals on Nov. 9th to headline the month’s action. A 17-year-old, 2020 NHL Draft eligible, native of Feldkirch, Austria, Rossi continues to lead OHL rookies in scoring with 13 goals, 14 assists and 27 points despite missing the past two weeks to injury. His plus-23 rating is among the best in the league while he’s also won 55.4% of his faceoffs this season. The 5-foot-9, 174Ib. centre was the 18th overall pick of the 2018 CHL Import Draft. Overage London Knights goaltender Joseph Raaymakers is the OHL Goaltender of the Month for November, playing to a perfect 8-0-0-0 record with a 1.99 goals-against average, .936 save percentage and one shutout. 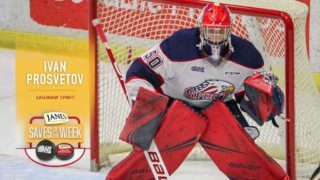 Raaymakers’ month was headlined by a pair of first star performances including a 30-save shutout in a 3-0 road win over the Kitchener Rangers on Nov. 4th. He followed up that showing with a 25-save effort in a 2-1 win over the Sudbury Wolves on Nov. 9th. Raaymakers turned aside 41 shots in a 6-3 win over the Erie Otters on Nov. 18th and closed out the month with 34 saves in an 8-1 win over the same Otters on Nov. 30th. 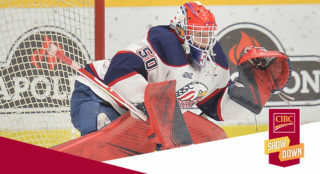 A 20-year-old native of Chatham, Ont., fifth-year veteran Raaymakers has helped backstop the Knights to a current 14-game winning streak, most recently earning his 90th career victory. Through 16 games he holds a 11-3-2-0 record with a 2.55 goals-against average and a .921 save percentage, earning his seventh career shutout in the process. Raaymakers attended training camp with the Columbus Blue Jackets this past September, seeing NHL pre-season action.